Acknowledged as an award-winning flat-picking guitar champion in his home state of Virginia, Keith Horne got his start in music playing guitar in his dad's country band at age 6 and later picked up bass when he was 12 years old. After winning a number of contests, Horne put together a jazz band that backed Ramsey Lewis on the BET cable channel. In 1985, Horne became a member of Secrets, a fusion group which included drummer Carter Beauford of the Dave Matthews Band and continued to play with them for the next seven years. Through the encouragement of the Wooten brothers (Bela Fleck and the Flecktones), whom he grew up with, Horne relocated to Nashville in 1992 in order to expand his visibility, and he maintains residence there today. Since his arrival in Nashville, Horne has been regarded as one of the most sought-after bassists in town and has toured across the United States with some of country music's most prolific artists including Tanya Tucker, Trisha Yearwood, and Lonestar. As a member of Trisha Yearwood's band, Horne's bass playing and vocal skills were heard by millions of late-night viewers of "The Late Show With David Letterman," "The Tonight Show With Jay Leno," "Austin City Limits," and other special televised events. 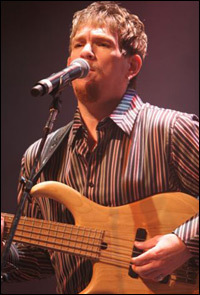 Following years of performing as a sideman alongside artists such as Peter Frampton, Waylon Jennings, and Ricky Van Shelton, Horne completed the lineup of Hot Apple Pie in 2003. 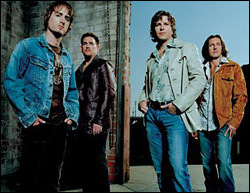 Fronted by Brady Seals, formerly of Little Texas, and comprised of some of the finest musicians in country music including Mark "Sparky" Matejka on guitar and Trey Landry on drums, Hot Apple Pie has since seized the attention of audiences, critics, and radio industry executives alike through their refreshing sounds. 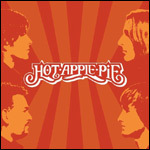 With four equally-versed multi-instrumentalists and a recording that contains a diverse collection of country, bluegrass, R&B, and rock-infused tracks, any number of which could be hit singles, Hot Apple Pie has already become one of the top bands to have stepped out of Nashville within the past couple of years. Backed by the hip-hop vibe of their first hit single, "Hillbillies," Hot Apple Pie's self-titled release debuted at #6 on Billboards' Hot Country Albums chart, ahead of Toby Keith, Kenny Chesney, Big & Rich, and Gretchen Wilson. Besides the strong airplay it received on radio stations around the country, "Hillbillies" established itself as a fan-favorite on both CMT's and GAC's Top 20 video countdowns. How did Hot Apple Pie form as a band? 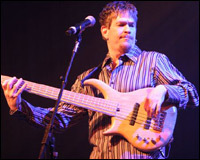 After Brady left Little Texas in 1995, he played and recorded as a solo artist for several years. Our guitarist, Sparky, and drummer, Trey, played on Brady's last solo recording, Thompson Street, and they also performed many live shows with Brady. Sparky and Trey had a lot of musical experience because they had been touring as sidemen for a long time so Brady asked them if they might be interested in forming a band. Soon, they began working on some of Brady's original material. They auditioned several bass players, but nothing really seemed to click. Some of the bassists didn't sing, and they really needed someone to cover the high vocal parts. While all of this was transpiring, I was playing with Sons of the Desert. We lost our record deal, and the group just fizzled out. Ever since I was a little kid, I always wanted to be in a band where I could play my music. I've been playing as a sideman for years with artists like Tanya Tucker, Peter Frampton, Trisha Yearwood, and most recently Lonestar, but I was always playing other people's music. The day after Sons of the Desert lost our record deal, I was talking with my best friend about how I'd like to get a band together and secure a recording contract. He told me that he had just received an e-mail from Gold Mountain Management who used to manage Brady, and they said that Brady was trying to locate a bass player who could also sing the high vocal parts for a new band he was putting together. I had met Brady, but I had never work with him before. I had never met Trey, but me and Sparky had played around town on several occasions. I called Brady on the phone. He asked me if I could sing, and I told him that is how I've gotten every gig I've ever played. I've always been able to sing all the high parts. He had a rehearsal scheduled for the following day, and he asked me to attend. Richard Landis, who has produced so many major groups, was going to be at the session and was interested in signing us. We played one song together and that was it. It all took off from there. This would have occurred in March, 2003. In June of that same year, we recorded a four-track demo while we were all still trying to pay the bills by playing as sidemen in other groups. Sparky was the guitar player in Charlie Daniels' band, and Trey was on the road with Rodney Crowell. I needed a gig so I went on tour with Lonestar, and I ended up playing with them for a year and a half. A few weeks after we recorded that four-track demo which consisted of the songs "We're Makin' Up," "Annabelle," "The Good Life," and "Easy Does It," our producer presented that material to the president of DreamWorks, and he signed us on the spot. About a month after we signed our record contract, DreamWorks merged with Universal, and thankfully, we made the cut because so many artists got dropped during this process. Then, after our record had been out for a few months, Universal went through another merger. DreamWorks was dissolved, and more artists were dropped from the label. We survived the cut once again and ended up on MCA so I guess we are doing pretty good! We just released our third single, "Easy Does It," which is a ballad, and everyone is expecting this song to do really well. I think the thing about Hot Apple Pie which is so appealing to people is that we play such a diverse selection of songs, and at live shows when you look out into the crowd, you see people spanning all of the age demographics from little kids to retired adults. Because of our different musical backgrounds, we can play practically any style of music. I think that is reflected really well on the CD, and there is something for everyone. With you, Sparky, and Trey constantly touring with other groups, how did you manage to record Hot Apple Pie? It was a challenge. Brady is the main songwriter so he was able to compose all of the songs at home while the rest of us were touring as sidemen with other groups, and we just recorded parts when we were available. At the end of August, 2003, we all spent a few days in the studio at the same time, and we were able to record the basic rhythm tracks. Sparky's guitar parts, Brady's parts, and the vocals all got recorded at different times. Sometimes me and Brady would be there to do vocals, and at other times, Brady and Sparky would be in the studio putting down vocals and guitar parts. Trey would go in and do his percussion parts. It took us about a year to finish the recording and have it all mixed and mastered. Even though it took us so long to finish the recording process, I think it was well worth it in the end because we got the finished product we wanted to make. I recorded about 75% of the CD with my Lakland Joe Osborn 4-string bass. I used my signature model Warrior 5-string bass on our first single, "Hillbillies." I also used a Lakland 5-string on a couple tracks, but the majority of the CD was done with my Joe Osborn bass. My basses were recorded with all the eq set flat through a Urie direct box/compressor. Whose idea was it to include 2 bass solos on a country recording? From the first rehearsal, our producer, Richard Landis, was impressed with my playing. Brady had written "Hillbillies" about 11 years, and it was really different back then. I started playing a bass line with my thumb while muting the strings with the side of my palm which gave it kind of a hip-hop vibe. Everyone loved it, and when we arranged it for the CD, Brady thought it would be cool to have a short break that featured the bass part. I never thought that bass breakdown would ever make it onto the CD or the single. They removed the guitar solo from the track and kept the bass break! There is a longer bass solo on "The Shape I'm In" which was originally recorded by The Band. We rearranged that song with a bluegrass feel to fit our style and also to feature me and Sparky's playing. Sparky acquired a degree in jazz guitar from North Texas State, and he is a monster guitar player with incredible chops. It's an uptempo tune, but we play it much faster during our live shows. It's such a fun tune to play live because we really get to stretch out on that one, and the audience just goes crazy. At first, I think people are kind of surprised to see the bass player in a country band take solos, but they really get into it. Do you get the opportunity to do more bass-featured playing during live shows? It depends on the kind of show we are playing. If we are opening up for a major artist like Tim McGraw, we generally will play between a 45-60 minute set. During those shows, we play mostly material that is on the CD. If we go out on the road on our own where we can play a 2-hour show, then we each have songs that feature our playing. For example, I'll sing "Shakey Ground" by the Temptations. It's a funk tune in E that people can dance to, and they really dig it. I'm working on an original tune that is kind of funky but also has a country/bluegrass feel to it. I started as a country/bluegrass musician, and this new tune covers the entire spectrum of music I started on. What is a typical day on the road as a member of Hot Apple Pie like? Generally, we'll arrive at our destination by around 8:00 in the morning, depending on how far we had to travel from our gig the night before. We'll wake up about 9:00, and our tour manager will get a hotel room for us. We can check in early since we aren't going to be staying overnight, and the hotel can rent the room to someone else because we'll only be there for a few hours before heading off to the soundcheck. I'm really into working out so as soon as we arrive at the hotel, I'll go to the gym and workout for at least two hours. When I'm at home in Nashville, I'll workout four hours per day. I do a lot of cardio training. I've been working with a trainer, and I've lost 275 pounds! I can almost wear 33-inch waist jeans. If you haven't seen me in awhile, you probably won't recognize me. I used to lift weights and play football in high school, but I gained a lot of weight after the sports ended. I'm not trying to get all ripped with muscles, but I'm trying to stay as fit as possible. I eat really healthy now, too. We'll arrive at soundcheck around 3:00 in the afternoon, and then we'll eat at about 5:00. Our shows normally start around 8:00 so we'll have at least a couple hours to hang out on the bus. Our bus is fully loaded so we can watch TV, play DVDs, listen to the stereo, and iPod's. Brady and Trey can sit in front of the PlayStation for hours. We'll hit the stage around 8:00. The length of our show depends on who we are opening up for or if we are headlining our own concert. After the concert, it takes the crew a couple hours to pack everything up, and then we are back on the road again to our next show. It's a routine that contains a lot of sitting around and waiting, but sometimes I'll mix things up a little and go back to the hotel to workout after the soundcheck. It all depends on the timeframe. Sometimes we stay overnight, but 90% of the time, we move on to the next town. Who has Hot Apple Pie been with on tour? Last year, we opened a lot of shows for Tim McGraw, and played huge arenas in front of 20,000 or more people each gig. We share the same management. We did a few shows with both Tim and Keith Urban. We also played a lot of festivals where we played alongside five or six other bands such as Montgomery Gentry or Jo Dee Messina. Festivals are my favorite gigs because I know practically every musician in every band. Rarely, do you ever see these musicians in Nashville because everyone's schedule is so different. When musicians are in town, they are busy with other things such as family so festivals give you a chance to hang out and catch up with people. Since everyone in Hot Apple Pie plays multiple instruments, do you guys switch instruments during live shows? Between the four of us, we can play 13 instruments so we can cover a lot of parts. For most of "The Shape I'm In," I play acoustic guitar and Brady plays bass. Me and Sparky will trade acoustic and guitar solos, and then when it comes time for the bass solo, I'll pick up my bass while Brady jumps on his B-3 organ. This year, I'll be taking my steel guitar on the road as well. We can play a lot of different music in this band. We play mostly original songs, but we also play a number of cover songs such as "What I Like About You" which we have arranged as a rockin', uptempo tune. What gear are you using on tour? Currently, my Warrior 5-string is my main bass on the road. I'm waiting for a new Warrior Isabella 4-string bass which should be ready very soon, and then it will become my main bass. I can play 4-string during 75% of the show because that is what I used to record most of my bass parts. I really miss playing 4-string during live shows. I'll still use my Warrior 5-string on "Hillbillies" and a couple other tunes, but I can cover most of the range needed to play my parts on a 4-string. Rarely do I ever play beyond the 12th fret, and if I take a solo, I'll pick up the 5-string. I have a really nice Warrior 6-string bass, but unless I'm going to do some kind of solo feature, it just doesn't make sense to take it with me. For amplification, I've been using a Thunderfunk amp with a SWR Goliath Sr. speaker cabinet. How many singles do you expect Hot Apple Pie's debut recording to produce? The record label has been talking about releasing four singles. So far, "Hillbillies," "We're Makin' Up," and "Easy Does It" have been released as singles. Unfortunately, "We're Makin' Up" kind of got lost in the mix of things when we moved from DreamWorks to MCA. If there is another single, it might be released during the summer, and it could be "Redneck Revolution." That song goes over really well live. It's got a southern rock feel to it, and that style of music is really popular right now. The record company makes the final decision on this so anything is possible. There might not even be another single released from this recording. It all depends on how well "Easy Does It" is accepted. Most bands are lucky to get two singles released so we've already done well. Now that Hot Apple Pie has released 3 singles, what is next? We're hoping to secure a major tour this year. There has been talk about us opening up for the Tim McGraw/Faith Hill tour which would be huge exposure for us. Tim has been really great to us. Tim and Brady have known each other for years because when Tim was starting out he used to open up for Little Texas. We'll probably start recording the next project towards the end of the year. We may do some recording before then just to see how things develop over time. We've been writing material so things are already starting to take shape. Brady has been a songwriter all his life, and he's been writing with a few people around town. I'm excited about the possibility of the next recording featuring me more on lead vocals. You've always been recognized for remembering how to play so many different songs. How do you memorize tunes? I don't really have one particular process for memorizing songs. I've always had a good memory and the ability to play things years after only having played that tune one time. It's a weird gift I guess. I don't have perfect pitch, but I can hear something, and then figure it out really easily. I can tune up a guitar really close to pitch when changing strings without using a tuner. When I first moved to Nashville, I would go from playing Merle Haggard songs one night to playing with the Wooten brothers the next night, and I just absorbed all of those tunes I played. A few years ago, I did some shows with Tanya Tucker in Denmark and Norway. I hadn't played with her since 1995, but all I did was listen to the tunes a few times on the airplane over there and did the show. Singing and playing at the same time has just always felt really natural to me. Like memorizing songs, it's something I've never had to devote much time to practicing. I've done both all of my life so I don't need to think about it much. I'm a huge fan of Mark King (Level 42). I have everything he's ever recorded, and the stuff he plays and sings at the same time is just amazing. I always learn the bass part first, and then I add the vocal line. Once I have the bass line down really well to where I don't have to think about it, adding the vocal part is easy. Last year, I started working on playing steel guitar and singing at the same time, and that's really challenging because there is so much involved in playing steel guitar since all of your legs and arms are constantly moving. Is your DVD, Bass Techniques, still available? Yes. I'm selling it direct. The company that was distributing the DVD just shut the doors and vanished. I still have the masters, and a friend of mine is making copies for me. I'm able to sell them a lot cheaper than that company was selling them for, too. 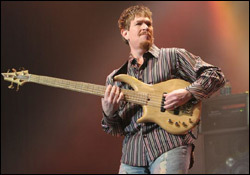 It's primarily a performance-oriented DVD where I demonstrate the techniques that I use on bass. If anyone is interested in purchasing one of these DVDs, just e-mail me. What do you enjoy doing in your free time when not on tour with Hot Apple Pie? Within the past five years, I've really gotten heavily into bowling. I used to bowl back home in Virginia, and on average, I'll bowl almost a 200. Every Tuesday here in Nashville, a bunch of musicians will meet at a local bowling alley during the day and hang out. We'll have between 16-18 guys show up. Most of them are bass players and drummers, but a few guitar players and pianists will come out, too. Some of these guys are serious bowlers and can bowl over a score of 225. Up to three years ago, I was really into drag racing. My Mustang could run the 1/4 mile in 9 seconds at 162 mph. I'd like to get back into racing again.